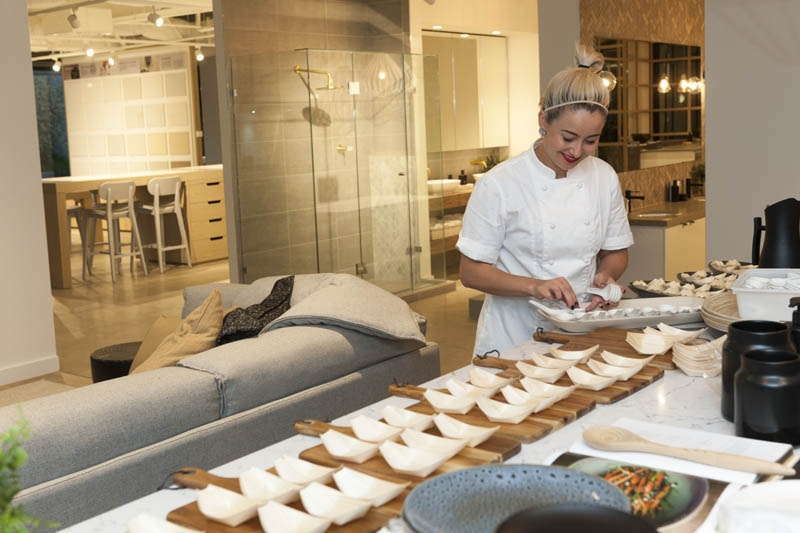 MasterChef 2017 fan favourite Tamara Graffen shares her kitchen style and design preferences after presenting a delicious five course bespoke menu at the recent Henley Design launch. Asked which kitchen on display she loved the most, Tamara immediately gravitated to our Hamptons inspired kitchen which features a colour palette of true white and battalion from Laminex’s new form wrap range. Caesarstone London Grey benchtops compliment the splashback to create an elegant yet homely space, with perfectly balanced display storage and cabinetry options. Tamara choose to plate and serve from this space, showcasing both its functionality and beauty. Tamara adores a large island bench for prepping and entertaining. She also said that concealed storage space for appliances, pots and pans is a must-have. And when you're famed for cooking and baking, having at least two ovens is THE dream, with one of them having steam function for the best baking. A large bench space is ideal as it then becomes a multipurpose space. It's easy to prep beautiful food on and can also be an informal dining area for entertaining friends and family while you whip something up in the kitchen. Tamara said she loves an island bench that you can't reach all the way over. Tamara has always loved concealed cupboards for practical storage of kitchen essentials, but she was particularly enamored with the glass display shelving in the Hamptons display kitchen. She said they're a great place for showing off a cookbook collection or your finest glasses and serving ware. Other features of the Hampton styled kitchen include the oversized undermount sink in white Fragranite finish, large pot drawers for storage and the fully integrated bin and dishwasher for a seamless look without compromising the elegant aesthetic of the kitchen. Declaring she can't live without her bright yellow KitchenAid mixer, Tamara said it's not only functional for meal prep - it also adds a bright pop of colour to her otherwise neutral kitchen. 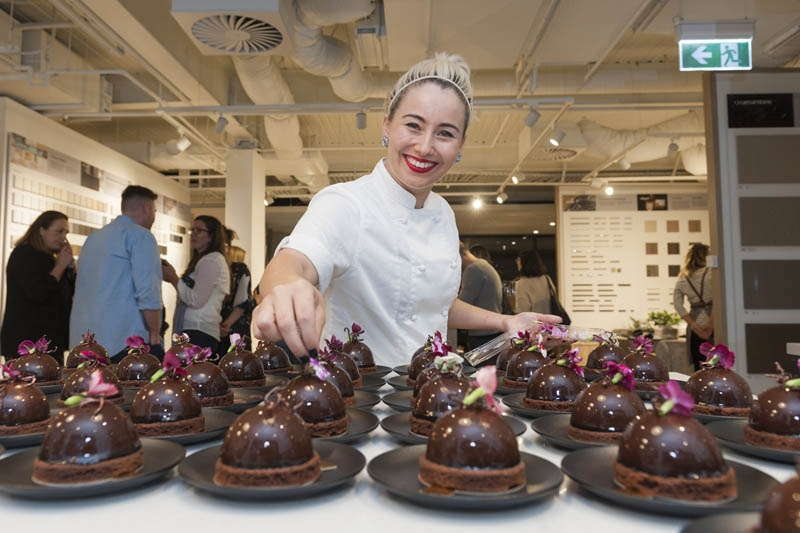 While Tamara has had a dream run of chefs to cook for during MasterChef Australia, she says she’d love to cook for Peter Gilmore and Allah Wolf-Tasker again as they are culinary legends and so charming and warm with great food philosophy. She’d also love to put a plate in front of Massimo Bottura of Osteria Francescana in Modena, Italy. His food is an inspiration to Tamara because of his artistic composition and presentation. 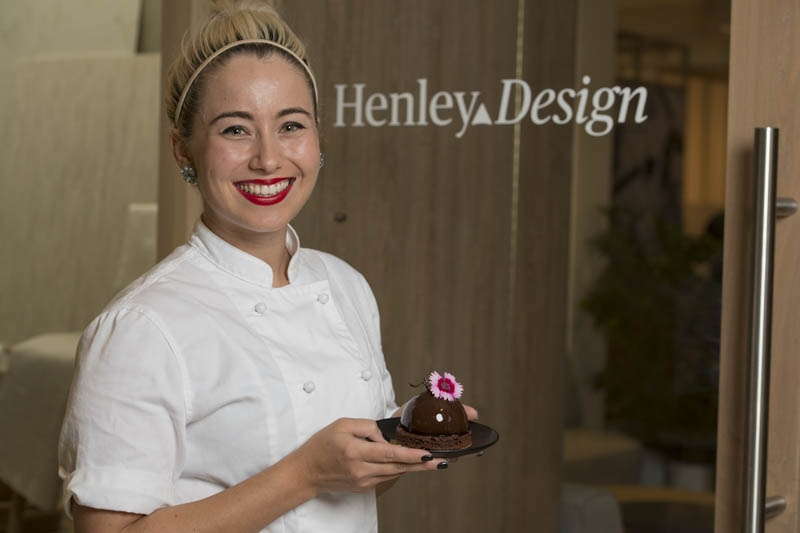 The team at Henley were so delighted to have Tamara join us in the Henley Design kitchen and of course, we enjoyed the delicious canapes she prepared.